Located on the Atlantic coast of France in the region of Vendée, Saint Hilaire de Riez is home to beautiful beaches backed by rocky cliffs and a pretty village full of historic sites and architecture. The city of Nantes can be found just over an hour away, offering visitors access to a huge range of facilities and attractions, and the neighbouring town of Saint Gilles Croix de Vie and its lively atmosphere can be reached in under 10 minutes by car. Behind the town itself, beautiful rural landscapes and salt marshes offer much to be explored. Yet there is no question that the town's main attraction is its 12km of sweeping, clean and sandy beaches. Enjoying a fantastic location close to the beach as well as the centre of the town, Summer France specially selected cottages offer plenty of opportunities for guests to enjoy everything this region has to offer. With onsite swimming pools visitors can enjoy the 200 days of sun the region of Vendée is awarded with, as well as comfortable bright surroundings and décor. A seaside town with a strong family orientation, Saint Hilaire de Riez offers beachside relaxation and fun in its droves! Sion, La Parée-Préneau, Mouettes, Becs and Demoiselle beaches are all well worth a visit and many are supervised during the summer. While the gorgeous beaches are the main attraction in Saint Hilaire de Riez there is still much to be explored in this amazing region of France. Being so close to Saint Gilles Croix de Vie means that visitors get the best of both worlds: a picturesque seaside holiday combined with the busy harbour town and bustling entertainment scene. Hikers and walkers will enjoy the Dominal pine forest just minutes from the town, as well as long stretches of sandy beaches and cliffs perfect for an afternoon stroll. There are cycle trails dedicated to cyclists as well as horse riding excursions that visit the beach, go into the forests and even into the sea! Those wishing to dip their toes in the Atlantic during their holiday in Saint Hilaire should try some of the many water sports available. Sailing and sea kayaking are great ways to explore the coast from a different angle, while sea fishing is also offered. Kite flying is an ideal activity for families, or a visit to L'ile aux Jeux park will be sure to entertain little ones with its trampolines, ponies, mazes and more. Those wanting to explore the history and culture of the town should simply wander through the streets, admiring the whitewashed buildings with their colourful shutters  and a visit to the Church of Saint Hilaire is also a pleasant stop-off. The market is a great way to pick up souvenirs and local handicrafts, as well as food sourced from the local farms. It's a fantastic way to meet some of the friendly local residents as well. Flora and fauna lovers will find a diverse range of wildlife here, with butterflies, plants and some stunning birds calling the area home. 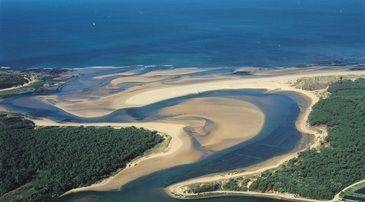 Saint Hilaire de Riez is located in the Vendée region, where you'll find some incredible dishes and delicacies available. The town is home to fishermen bringing in their catch of the day, with fish going from boat to restaurant in the same day. Visitors can enjoy a range of local favourites, including freshly caught clams and shellfish, as well as bass and sole. The market is open on Thursdays and Sundays, allowing guests to pick the freshest ingredients from farms in the local area, ideal for those wanting to self cater. For a small town there are plenty of restaurants, with over 15 to choose from. Here you can visit street side cafés where you can enjoy a delicious cake or pastry as you watch the world go by, as well as friendly brasseries and local fish restaurants. With some fantastic vineyards dotted around the surrounding region there are some incredible wines to wash down a perfect meal, too! 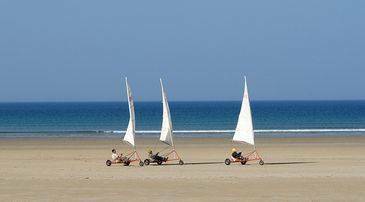 Saint Hilaire de Riez is home to a gorgeous stretch of soft sand where guests can enjoy a range of activities and facilities, whether travelling with the family, in a group, solo or as a couple. Summer France pretty cottages are well-located, close to the sea and the activities and amenities of the town. offers guests a range of cottages, sleeping from four to six people. The central area has a clean swimming pool ideal for sunbathing and little ones wanting to splash about, while the cottages themselves are clean and bright. Guests can enjoy light open spaces and modern interior décor, along with vibrant furnishings during their stay here. Each of the cottages comes with a fully equipped kitchen or kitchenette, allowing the freedom to try the restaurants in the town as well as cook delicious dishes using fresh ingredients from the local market and shops. In the heart of a beautiful forest, there are plenty of activities and facilities to be explored within walking distance from the cottages, with hiking, cycling, horse riding and more available. Book today with Summer France, the French accommodation specialist, and get the most from your holidays in Saint Hilaire de Riez.